A study of Thomson-Scientific ISI ranked Library and Information Science (LIS) journals (n = 52) is reported. 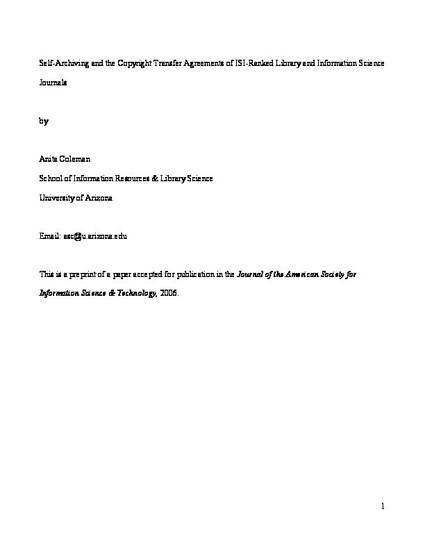 The study examined the stances of publishers as expressed in the Copyright Transfer Agreements (CTAs) of the journals toward self-archiving, the practice of depositing digital copies of one's works in an Open Archives Initiative (OAI)-compliant open access repository. Sixty-two percent (32) do not make their CTAs available on the open Web; 38% (20) do. Of the 38% that do make CTAs available, two are open access journals. Of the 62% that do not have a publicly available CTA, 40% are silent about self-archiving. Even among the 20 journal CTAs publicly available there is a high level of ambiguity. Closer examination augmented by publisher policy documents on copyright, self-archiving, and instructions to authors reveals that only five, 10% of the ISI-ranked LIS journals in the study, actually prohibit self-archiving by publisher rule. Copyright is a moving target, but publishers appear to be acknowledging that copyright and open access can co-exist in scholarly journal publishing. The ambivalence of LIS journal publishers provides unique opportunities to members of the community. Authors can self-archive in open access archives. A society-led, global scholarly communication consortium can engage in the strategic building of the LIS information commons. Aggregating OAI-compliant archives and developing disciplinary-specific library services for an LIS commons has the potential to increase the field's research impact and visibility. It may also ameliorate its own scholarly communication and publishing systems and serve as a model for others.